Despite loud calls from the United Nations (UN) and the European Parliament (EP) to release all the Saudi human rights defenders detained in a recent crackdown that began on 15 May 2018, Saudi Arabia arrested two more women’s rights defenders over the past several days, bringing the number of those arrested close to 20. Other women’s rights defenders have been placed under travel ban. First, on 06 June 2018, journalist and woman human rights defender Nouf Abdulaziz was arrested after a raid on her home, and taken to an unknown location where she has been held incommunicado. Abdulaziz writes for many publications and was a newspaper editor and a television producer. 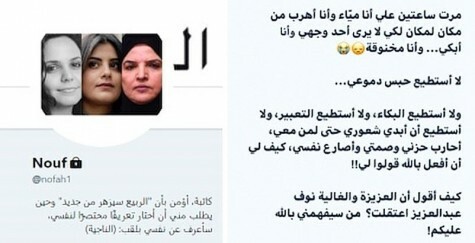 Her twitter profile (see above) shows three of the women already arrested in May 2018 - Loujain Al-Hathloul, a well-known women’s rights defender on social media; Dr. Eman Al-Nafjan, founder and author of the Saudiwoman's Weblog; and Aziza Al-Yousef, a prominent campaigner for women’s rights. Following Abdulaziz’s arrest, woman human rights defender Mayya Al-Zahrani published a letter from Abdulaziz, who prepared something for publication in case she was arrested. Al-Zahrani was then arrested herself on 09 June 2018, for publishing the letter. Saudi Arabia’s Okaz newspaper reports an unnamed source saying they have been referred to the Specialised Criminal Court (SCC), and they could face between three and 20 years in prison if convicted. The SCC was set up to try terrorism cases, but has been misused. Saudi Arabia began issuing the first driving licences for women last week, ahead of the official end of the ban on women drivers on 24 June. As part of the widespread crackdown, GCHR has received information that at least 10 other women’s rights defenders and activists are banned from travel. Emmerson also told said it was “a matter of shame for the UN that it allowed Saudi onto the UN human rights council (HRC)” in 2016.